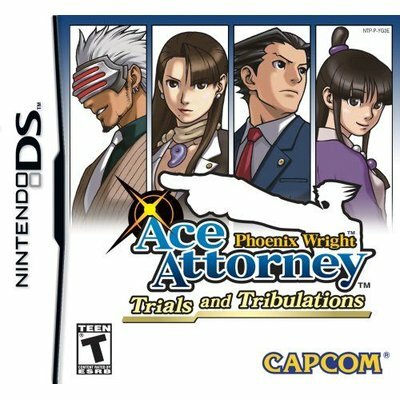 In Phoenix Wright: Ace Attorney Trials and Tribulations players star as a defense attorney, who must prove a seemingly guilty client's innocence no matter how dire the circumstances may seem. Phoenix will face the toughest prosecutor yet as the mysterious hard-boiled Godot will try to take him down at any cost. The complete story of Phoenix Wright comes together as truths are revealed in twisting storylines and intriguing gameplay. Players must collect evidence, survey crime scenes, weed through inconsistent testimonies, and overcome corrupt agendas to ensure that justice prevails. With the return of the popular pysche-lock interrogation tool from the previous title, Phoenix Wright: Ace Attorney Justice for All, players will have to overcome even more intense courtroom standoffs in order to close the case. Play from the first person perspective through five intriguing new cases. Play as two lawyers - relive Mia's rookie days from the past and Phoenix's current cases in the present. Colorful cast of characters: Phoenix Wright - the game's main character who is an accomplished defense lawyer with a keen sense for discerning fact from fiction. Maya Fey - a bright young girl; Mia Fey - an ace attorney. Two distinct gameplay segments: Investigation phase - survey crime scenes, interview witnesses and gather evidence. Court phase - present findings from the investigation to support your case, listen to testimonies and examine witnesses. Psyche-Lock system: Break down tough witnesses with a series of correct questions or catch them on inconsistencies.